in this classic Vis à Vie fit for royalty. Excellent for formal special occasions like weddings and proms. 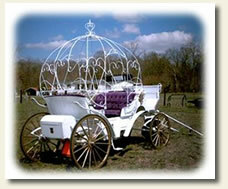 It is the most popular carriage that we have. It features a Cinderella canopy for any special event and the royal velvet purple interior shows off the elegance of any occasion.